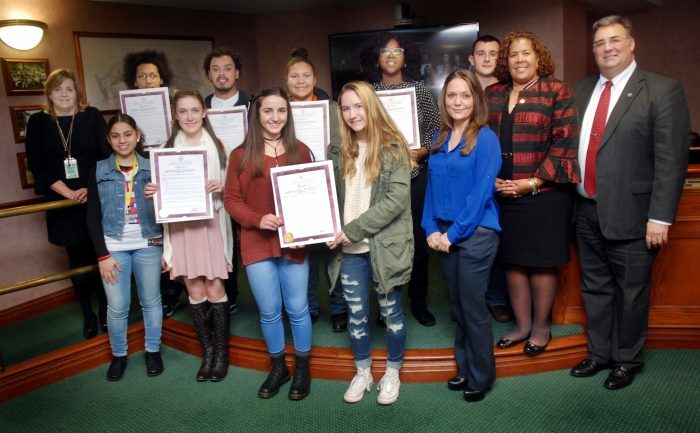 Union County Freeholders Linda Carter and Alexander Mirabella presented resolutions to members of Team Orange from the Union County Student Training and Enrichment Program (UC STEP) congratulating them on winning the Civic Engagement Challenge of 2016 UC STEP. They were joined by Union County Economic Development Director Amy Wagner and Deana Mesaros of the Department of Economic Development. UC STEP was created to provide high school students the opportunity to develop a countywide community service around a topic they feel is important, while teaching them leadership and personal growth skills and responsibility within their communities. A total of 195 sophomores and junior high school students from 21 high schools throughout Union County participated in the annual program, which took place in December 2016 at Kean University in Union. Team Orange’s campaign “Kans for Kids” is a collection project that focuses on the gathering nutritious canned items that they turned into “canstruction.” The structure building competition is the finale of the project as each strived to have the best looking display. All proceeds benefit the Community FoodBank of New Jersey. Team Orange members attend the following high schools: Arthur L. Johnson High School, Cranford High School, David Brearley High School, Governor Livingston High School, Linden High School, John E. Dwyer Technology Academy, Jonathan Dayton High School, Plainfield High School, New Providence High School, Rahway High School, Scotch Plains-Fanwood High School, Union County TEAMS Charter School, Union County Vocational-Technical High School and the Barack Obama Academy for Academic & Civic Development.